The newest debate in America’s culture war is over the egg spoon. It’s a great example of how Americans are driving themselves insane by insisting that even their smallest consumer actions have bigger moral implications. Do you ever feel as though people have become incredibly annoying and you just want everyone to shut up for a second? I feel like that a lot lately. In related news, The New York Times reports that people are fighting about egg spoons. What’s an egg spoon? You’re going to be sorry you asked. The egg spoon isn’t really a spoon at all – it’s a small iron pan with a long handle that you can use to cook a single egg over an open fire. And the fight over the egg spoon – and whether its users are pretentious elitists and/or its detractors are sexist – is a great example of how Americans are driving themselves insane by insisting that even their smallest consumer actions have grand moral implications. If we believe we show the world how good we are through our consumption choices – an increasingly common view that companies are finding more and more ways to exploit – then it’s inevitable we’re going to end up having nasty fights over $US250 egg spoons. This is your future, America. 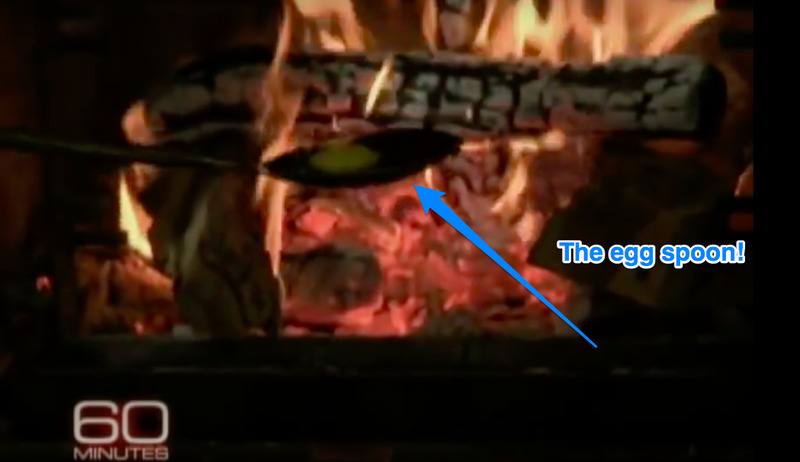 The egg spoon first came into broad public view in 2009, when Alice Waters used it on “60 Minutes” to cook an egg for Lesley Stahl. Waters, the chef at Chez Panisse in Berkeley, California, is one of the leaders of the “slow food” movement, built around ideas like buying local, supporting family-owned and organic farms, and preserving local food traditions. What people find annoying about slow food is the implicit (and in some cases explicit) contention that slow food is an ethical obligation – and therefore, that proponents and practitioners of slow food have not just better taste, but better values, than those who eat mass-market, factory-farmed food. This claim of moral superiority is ripe for backlash, and we can see it in the response to the egg spoon. But it’s not good enough for the egg-spoon detractors to say that cooking a single egg over an open fire seems silly. No, the response has to be that the egg-spoon buyers are a bunch of rich people play-acting as poor for fun, spending absurd sums on esoteric tools like the egg spoon so they can cook in a manner that’s viable only if you have a great deal of leisure time. How can they possibly be ethically superior when the activity that’s supposed to show such ethical superiority is out of reach for so many Americans without space for an open fire in their kitchen or $US250 to spend on an egg spoon? With this argument, non-slow-fooders don’t just get to reject the notion that their food values are inferior – they get to claim the moral high ground for themselves, as the slow-fooders have shown themselves to be out of touch and elitist. And then there is the backlash to the backlash, with the pro-spoon side saying we see this reaction only because Waters is a woman, and that nobody balks when male chefs want to spend $US300 on an immersion circulator so they can do something equally precious, like cook a single egg sous vide. And now nobody can just enjoy their damned eggs because we’re so busy fighting over what our eggs say about us – which is a shame, because the food at Chez Panisse is very, very good. As the NFL is learning the hard way, it’s becoming harder to disentangle questions of product preference and taste from those of values and politics. And this is causing people to lose things they used to enjoy. Conservatives have to stop flying Delta. Liberals can’t eat Chick-fil-A anymore. I am not especially concerned about the effect these trends will have on the economy or public policy. In fact, there may be a policy benefit to the increasing political polarization of products and services: If it becomes harder for companies to work both sides of the aisle, it will be harder for them to extract corporate welfare from officials in both parties. But I do worry about the effect this trend is having on individual consumers. Because at the same time our politics are becoming nastier and stupider, everything else in our lives is becoming less separable from politics. Something that helps hold society together is that people who are separated by their political and moral views can bond over other things. But as there are fewer “other things” to bond over – partly because we’re sorting into brands patronized by people who already share our values, and partly because it’s harder to discuss our leisure activities without getting into political disputes – people are forced to increasingly devote mental space to exhausting fights over politics and values. It becomes impossible to discuss even something as trivial as the egg spoon in terms that do not relate to the grand cultural divides that define our current political moment. And therefore, it becomes safer to have conversations only with people who agree with us in the first place. Plus, many people have felt the need to give up products and services that used to make them happy so they can sort into the right side of these fights, and they’re grumpy about it. What I’m going to say is obviously antithetical to the slow-food movement, but I think it would serve a lot of us well to be less mindful of some of the things we buy and eat. Just eat the eggs. Taste them. Enjoy them. Don’t think too hard about what they say about you. Cook them however makes you happy. Buy an egg spoon, or don’t. And then repeat this mental simplification process with as many products and services as you can manage. And if you think Alice Waters is ridiculous for using such an expensive device to cook her eggs in such a labour-intensive way, remember that your hobbies are probably kind of stupid too. That doesn’t mean we have to judge each other. And even if you suspect she does think the way she eats makes her morally superior, that doesn’t mean you have to have a fight about it, even if you disagree. Just eat your eggs and smile.